More and more people are giving to churches electronically. 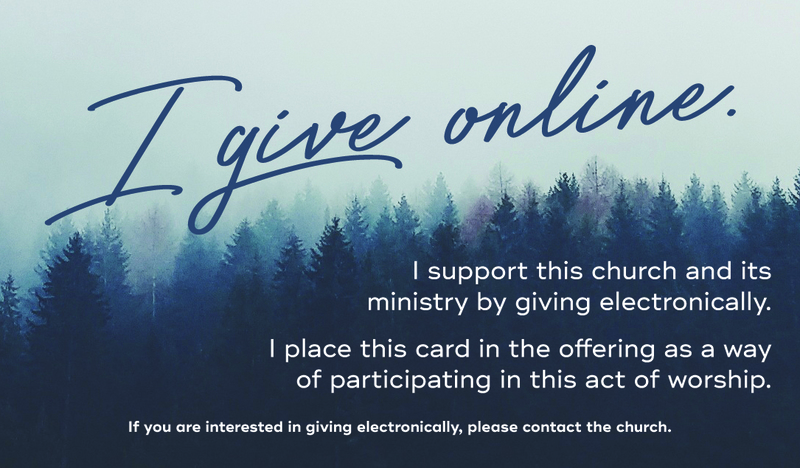 Whether they make individual online donations or set up recurring payments, they support the church in the same way as those who give in person. Yet, when we invite worshippers to place their tithes and offerings in the plate, basket, bag, joy box, etc., they are left out. It allows online givers to participate in this act of worship. It tangibly reminds online givers of their gift, which may not be top of mind — especially if it’s automated. It allows online givers to model to others the spiritual discipline of giving. The images below are sized for the standard business card from VistaPrint (choose the “use your complete design” option). These cards are very affordable (May 2016 promotional pricing has 500 one-sided cards for $9.99 plus shipping), and they can be reused many times. Simply provide them in the back of the chairs/pews or at a designated location in your worship space. Then invite those who give online/electronically to place a card in the offering at the designated time.